Most important part of a computer is probably hard disk . All other parts can be replaced in occurrence of a damage or failure .But files and folders in Hard disk cannot be recovered to to the full extent. Here comes the need of hard disk monitor / diagnostics softwares which continuously monitor hard disk health against temperature and aging .O&O Drive LED 2 is one such software which costs usually around 20 USD . But with this promotional offer , you will get a full version serial of O&O DriveLED 2 absolutely free . O&O DriveLED 2 works only with hard disk having S.M.A.R.T inspection facility . Access and display S.M.A.R.T data from hard disks. 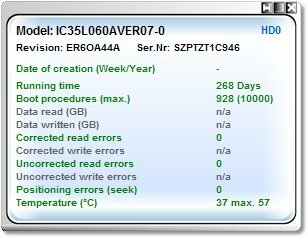 Predicts the life period of hard disk . Performs periodic diagnostic and warning messages if required . How to get O&O DriveLED 2 full version serial . Go to this promotional page and sign up with your email address and other details . O&O DriveLED 2 license key will be then sent to the submitted email address . This is a promotional legal version of the software If you have any doubts ,contact us via form . Download O&O DriveLED 2 hard disk diagnostic and monitor software for Windows .